After a welcome from President Fern Shepard and Board Chair Kef Kasdin, several experts gave a sobering picture of threats to science, health, and wildlands under the Trump administration. Rachel’s Network Liaison and Defenders of Wildlife President and CEO Jamie Rappaport Clark talked about the riders designed to weaken the Endangered Species Act and the hampering of agencies like the Department of the Interior. Union of Concerned Scientists (UCS) Executive Director Kathleen Rest and 30-year EPA staffer Betsy Southerland explained how Scott Pruitt’s EPA is staffing up with industry shills, cutting funding, removing vital information from agency websites, and failing to enforce existing laws. Organizations like Defenders and UCS are doing everything possible to fend off these attacks through press coverage, litigation, and Congressional action. Despite this dire situation, the grassroots is mobilizing like never before, said Rachel’s Network Liaison and US Climate Action Network Executive Director Keya Chatterjee. Pointing to events from India’s independence movement to recent demonstrations for gun control, Keya said that three elements must be in place for movements to win: political leadership, a permissive majority, and an activist base. “It’s critical that, as we do this work, we follow the lead of those most impacted,” she emphasized, adding that funding the grassroots is key. Advocates are also working through the legal system to fight back. Our Children’s Trust Executive Director and Chief Legal Counsel Julia Olson joined by live video to update guests on the status of her organization’s climate change lawsuit against the US government on behalf of youth plaintiffs ages 10 to 21, along with other state climate lawsuits in the works. “As adults, one of the most important things we can do is give young people a platform,” she said, citing the long history of youth-led social movements. On Tuesday morning, Center for Spirituality in Nature Founding Director Beth Norcross led a contemplative urban nature walk around Dupont Circle. At breakfast, Writer and PEN International President Jennifer Clement talked about the power of literature to create social change, her organization’s work to protect environmental journalists around the world, and principles from her PEN’s new “Women’s Manifesto” that calls for equality in media and literature. In the afternoon, Network Engagement Director Ariana Carella led a conversation on current and future Rachel’s Network collective funding efforts, from strengthening the coalition fighting the US-Mexico border wall and creating a document library revealing Monsanto’s manipulation of science, to a leadership award for women of color working on environmental issues. Former Maryland Senator Barbara Mikulski welcomed guests by video to open our Rachel’s Action Network afternoon on women in politics. Reflecting on her long career in Congress and her work to protect the environment, Senator Mikulski’s resolute passion inspired guests to recommit to their work to build a better world. Three Point Strategies Founder Jessica Byrd, Rachel’s Network Member Cathy Carlson, League of Conservation Voters Legislative Director Sara Chieffo, Rachel’s Network Liaison and Center for American Women and Politics Director Debbie Walsh talked about the prospects for women candidates in this new political moment and lessons for the future. 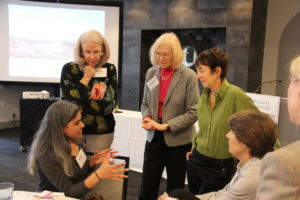 Sara cited statistics showing that women continue to outvote their male colleagues on environmental policy, a trend highlighted in our When Women Lead report. “The environment does better when Congress looks like America,” she said. 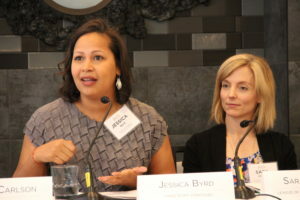 Despite the incredible growth in women running for office this year, there are still major structural barriers for women of color in particular, said Jessica. Debbie added: “At no level of office do women hold more than 25 percent of seats.” We still have a long way to go. We had a chance to hear directly from some of the candidates at the forefront of this wave of women. US Congressional Candidate Leslie Cockburn and Maryland House of Delegates Candidate Stephanie Smith shared their experiences running for office and their reasons for making environmental issues a central feature of their campaigns. While Leslie is running to represent a rural district and Stephanie an urban one, both believe that environmental issues resonate with residents, whether it’s fighting a gas pipeline or growing jobs in the recycling industry. Our last day opened with Investors’ Circle Program Manager Rebecca Price and Tiedemann Wealth Management Managing Director and Principal Brian Pierson who provided the latest best practices from the world of impact investing. They explained how people can use a variety of tools to grow sustainable businesses through their investment portfolios. “This is not a ‘should do,’ but a ‘have to do,’” Brian said, pointing to the urgent global environmental and human rights challenges that require capital. 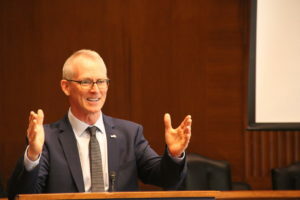 Former Republican Representative and republicEn Executive Director Bob Inglis, Retired Navy Rear Admiral Anne Phillips, Evangelical Environmental Network President & CEO Mitch Hescox, and DEPLOY/US CEO Andrea Yodsampa shared their work to bring military, faith, philanthropic, conservative and business perspectives together for climate action. “Political orthodoxies appear fixed, but they’re actually fluid,” said Bob, who works to engage conservatives in policy solutions to climate change. Andrea echoed the sentiment: “climate change can become a bridge across all of these [political] divides.” Authentic messengers, whether it’s a military general or a religious leader, are key to communicating the issue to different constituencies. After a brief preview of the film The Age of Consequences and a video introduction from producer Sophie Robinson, Anne and Andrea talked about climate threats facing the military, such as sea level rise. While the military is taking action and writing reports at a strategic level, there’s a lot of work to do on the operational/tactical level, said Anne. Spitfire Strategies Founder and President Kristen Grimm closed our meeting with advice on engaging others in advocacy through storytelling. After guests shared their own moving stories about their work and our three days together, it was clear that while the threats to our planet are great, we have to tools to address them head on.